It’s a mixed bag this time round. There’s a modern ‘literary’ novel by a French writer who plays with form and and meta-narrative, a cosy crime novel set in an idealised French rural setting and a biography that verges on hagiography. Finally, there’s (for me) an oddity: a steampunk fantasy. However, let’s start in my comfort zone, with a science fiction novel, this one a classic from 1980. As before, the linked titles lead to the indieebook.co.uk page for the books; the cover images link to their Kobo pages. According to the author notes, Tevis was inspired to write this novel while a teacher at Ohio University, where he noticed a decline in the literacy rates of students. While that theme is prominent, what might strike a current reader more forcefully is the theme of the dominance of humanity by their inventions: in this novel, the robots are in charge, or, at least, they appear to be. The story is told in layered multiple perspectives, much like Wuthering Heights, beginning with the view of a super-robot, Spofforth, who wishes to die, but can’t, and then transferring to the viewpoint of a human, Bentley, who has, almost by accident, taught himself to read. Bentley’s lover, Mary-Lou, a fellow dissident, takes over for a section, after Bentley has taught her to read. Spofforth, wanting to live in a human partnership, has Bentley sent to prison and takes Mary-Lou as a de facto wife, and she recounts the story of this new form of slavery. After Bentley escapes prison and completes an epic quest through the American wasteland to return to Mary-Lou in New York, several chapters alternate between narrators until the finale, in which the three narrators join forces to bring their interrelated quests to a conclusion. Illiteracy is the key to the degradation of humans in this novel. Without books, they lead lives of directed dependence, unaware that the robots that control them are, in fact, compelled to obey their instructions. Blind to their power, they look to the robots for every decision and every service, from basic necessities to entertainment. For their benefit, the humans are routinely sedated and live half-lives of passive emptiness. The robots, meanwhile, fulfil their individual functions blindly, for the most part. Tevis is magnificent on purposeless labour: there are sentient buses that travel their routes empty, a factory that makes an endless stream of faulty product which is automatically recycled when it fails quality control, and there are food servers who regard the main purpose of their labours to be cleanliness and order, so that feeding people is a nuisance they try to control. The despair into which the human race has fallen is terminal: not only are no children being born, but suicides -ghostly, drugged and silent self-immolations- are frequent and increasing. Sedation, passivity and a code of manners that values individualism and privacy over interaction, intimacy and curiosity, keeps people in isolated, uncommunicative wretchedness. In this environment, Bentley awakens through his discovery of reading, stops taking his sedatives and begins to understand the human condition. In the midst of this bleakness, Bentley and Mary-Lou struggle, blinking towards a rediscovery of full life. Mary-Lou’s pregnancy marks an explicit turning point: it is this event which pushes Spofforth, the machine in superhuman form who is, nevertheless, sexless and longs only for death, to concoct his insane scheme to live with Mary-Lou as if they were lovers. The sterility of his condition counterpoints with the growing richness of Bentley’s experiences: he makes friends and comrades in prison, adopts a cat and escapes, and, through everything, seeks out books and the knowledge they contain. Painful as his journey back to the city is, it is full of sensation, human interaction and learning. Finally, on his return, he carries with him the full implications of Mary-Lou’s discovery that the machines were originally programmed to obey humans. Rather than overthrowing the tyranny of the machines, all they have to do is turn their backs, but not before they have obliged Spofforth’s ultimate wish: his longing for death. I am often amazed by the richness of the back-catalogue of even quite minor science fiction writers. There is so much in the heritage of SF writing that I realise that I shall never read it all, but I will also never run out of beautiful surprises. I had, I think, heard of Tevis. He wrote The Man Who Fell To Earth, and several non-SF books that were filmed, including The Hustler. I may have come across Mockingbird in The Encyclopedia Of Science Fiction, or Aldiss’ Trillion Year Spree*, because there’s just a hint of familiarity in the book. I am sure, though, that I have never read it before. It is a sombre, Delphic delight. *Having just looked it up, Mockingbird, or, indeed, Tevis, aren’t mentioned by Aldiss, and The Encyclopedia merely says, “Mockingbird rather mechanically runs its android protagonist through a process of self-realisation in a senescent USA 500 years hence.” So much for scholarship. I am not a huge reader of literary novels and, middle of the road reader that I am, I’m uncomfortable with structural experimentation in novels. I like a story, I like character, I like settings, and I like to be caught up in what I read. I had a brief sixth form infatuation with the meta-narrative of John Fowles in The Magus and The French Lieutenant’s Woman, but was put off by the later self-indulgence of Mantissa. Umberto Eco, apart from The Name of the Rose of course, defeated me for years, until I was surprised by the beauty of The Mysterious Flame of Queen Loana, which I read while I was a taxi driver. Later, I finally cracked Foucault’s Pendulum, picking it up to kill time when I was supervising assessments in Camp Hill Prison. However, when I am scouting around for an engaging read, ‘revolutionary form’ is not a quality at the top of my list. Such a position could be quite self-limiting, which is why the reading of criticism is valuable for me in extending my reading. I came to Laurent Binet through a review by Christopher Taylor of Bunet’s second novel, The 7th Function of Language, (my review of that novel will have to wait, as I haven’t finished reading it yet) in the LRB in early June. Taylor’s article was titled, Epsiteme, My Arse, which is probably the best title I have seen in that quixotic organ, but I would probably have read it if it had been called An Article About a Post-Modernist Novel About Post-Modernists, Starting With The Death of Roland Barthes and Featuring Michel Foucault, as post-modernism, and those two figures in particular, played an important role in my degree. Anyway, the review did its job, and I looked up The 7th Function on Kobo. It was still full price, and I was saving for my Fairphone, so I held back, but I downloaded Binet’s other novel, HHhH, somewhat dubiously. To my surprise, I was gripped from the beginning. This, despite the fact that, from the first chapter, it is clear that the ‘I’ of the book is not a fictional narrator, but the author himself, (I hate present authors), the topic is one in which I do not take any particular interest (the second world war) and its structure is deliberately broken and episodic (his chapters are frequently under 500 words; some are single sentences). Binet’s structural conceits are dictated by serious considerations of content. The book is about the assassination of Reinhard Heydrich, one of the foulest individuals to have disgraced human history. Every character in the book is a real historical figure, and the story itself is one that has gripped Binet’s imagination since he was a child. It is a story he has always wanted to tell, but it is a story (already told many times in histories, novels and film) that lends itself to somewhat glib, sensational forms. Binet is trying to write about a terrible undertaking, that was disastrous for every participant and for many, many people besides; that involved danger, terror and insane courage, and to avoid turning it into an adventure story. And, to accomplish that, he has to bind it up in a great deal of contextual content. Ultimately, when the deed gets underway, and the whole horrific story plays out, HHhH is as gripping as the best completely fictional adventure story: I felt my heart race as I read about the assassination and the manhunt that followed, and I grieved for the cornered soldiers and was horrified by the descriptions of the Nazis’ insane (and counter-productive) reprisals. This is an utterly compelling book. The care with which he constructs the entire world of the 1930s and ’40s disaster, and the time he gives to exploring and elucidating the deranged logic of the Nazis’ grandiose crimes, brings us into the inescapable conflict, in which so many people become prepared to throw their lives away with little hope of victory, besides the simple awareness that they are refusing to comply with evil: they are fighting for the freedom to be who they truly are. The great theme of resistance fiction is failure. Success was impossible; the act of resistance was understood to be at the least a mark of defiance, at the most a preparation for some later triumph. We know what the resisters didn’t: that their enemy would be defeated, though this would be an achievement they wouldn’t share. The war wasn’t won by assassinations and victory wasn’t assured by the small Western European resistance movements…Stauffenberg and the other conspirators of July 1944 understood that their plan to murder Hitler and stage a coup was unlikely to come off. Instead of success, there would be the recorded fact that they had tried. They played for moral stakes, upholding their own decency, the reputation of their country, and perhaps the idea of decency as such. For those of us who don’t know whether we would be collaborators or fighters, the resistance story offers both the tension of narrative and a defence of the virtues of integrity and solidarity. Whenever I talk about the book I’m writing, I say, ‘My book on Heydrich,’ But Heydrich is not supposed to be the main character…You see, Heydrich is the target, not the protagonist. Everything I’ve written about him is by way of background. Though it must be admitted that in literary terms Heydrich is a wonderful character. It’s as if a Dr Frankenstein novelist had mixed up the greatest monsters of literature to create a new and terrifying creature. Except that Heydrich is not a paper monster. 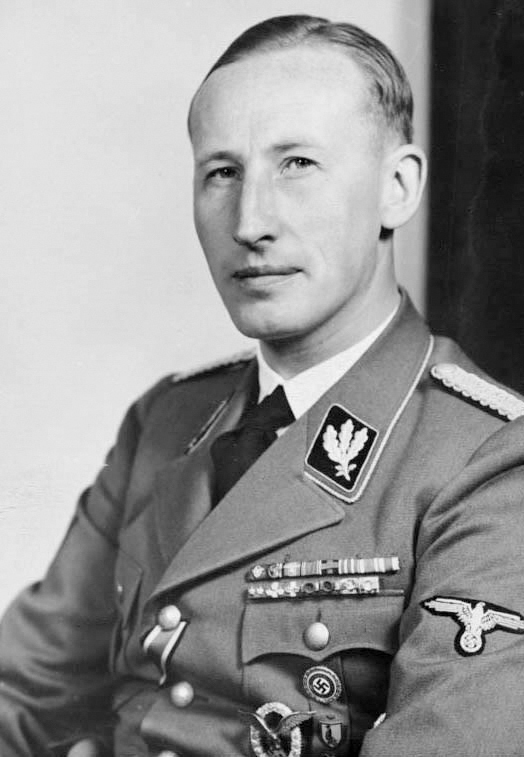 Heydrich is not seductive, despite his apparent omnipotence, his grandeur, his epic dominance. The Nazis admired him as a prodigy, and described his as handsome, although, as Binet notes, this doesn’t square with pictures of him. He was, to my eyes, as awkwardly malformed on the outside as within, but his vanity, combined with the power he exerted for a few short years, seems to have cast a spell that survived, for some confused or willful people, his destruction and defeat. Binet, in portraying him, skewers him. His perversion, his joyless amorality, his Hugo Boss-clad vanity seem reflected in his portraits, that cannot obscure the fact that one of his ‘great achievements’ was to grapple with the logistics of eliminating all the people of Europe who could be characterised as Jewish. He was driven, clever and meticulous, and his talents gave him what he wanted: power. He could, so easily, have become the ‘dark anti-hero’ of HHhH, as Hannibal Lecter, revoltingly, became the seductive core of all but the first of Thomas Harris’ perverted works. Instead, because Binet takes such care to place us within the predicaments of the victims of Heydrich’s reign in Praque, the monster is the enemy, and we are the resistance. For a while, when Mrs Moravec took her cyanide pill, or her poor, braver-than-brave teenage son, Ata, defied his Gestapo torturers, I felt that, in their place, I, too, might have found the resources within me to resist the calamity of Nazism, however terrible the consequences. And that, I think, is a real literary achievement. And now for something completely different. I can’t even remember what it was about Death In The Dordogne that caught my attention. It looks, from the cover, and the blurb, and its title, to be exactly what it is: the sort of unambitious series novel of quirky English condescension to a foreign culture, wrapped up in ‘deep love’ for its setting, and pitched towards media sales to an ITV production contractor, to star a middle-aged alumnus of the National Theatre. It would be screened on Sunday nights in the Autumn, taking the chill out of the lengthening evenings. If that description makes your spirits wilt, you should probably skip this section, but I, to my shame, really enjoyed this book. Martin Walker is English, and I apologise to him if any of my guesses about him are libellous, but I imagine that he is a well-heeled Blairite who moved to France after a career in something that paid very nicely indeed and considers himself a man born out of his time. I have avoided googling him, so this is pure speculation. Anyway, this is an utterly competent, warm-hearted mystery whose details have already escaped me. Someone is killed in a small, traditional town whose tightly-knit community has resisted modernisation but embraced inclusion, and some nasty outsiders appear to be responsible. The town and its surroundings are like the embrace of a gentleman’s club, and the world around it is a threat to all it holds dear: principally, from the evidence here presented, slaugtering and consuming the corpses of innocent animals in as many piquant and, somehow, cultured and enriching, rituals as can be fitted into long, sun-drenched days. The protagonist, Bruno, is a war hero with a thousand-yard-stare and a resistance to becoming embroiled with a woman. Not that he’s not up for a shag; oh no: there’s nothing queer about Carruthers, but he values his ordered life and pleasant routine, which contrasts so comfortably with all the silly running around that people get up to in the outside world. There’s a Parisian lady detective, fortunately, with short hair and several black belts in Karate, who becomes both an ally and a reminder of what he might be missing, and she has the good sense to throw herself at him and the good manners to get a job in Paris at the end of the book, ending the affaire (with an ‘e’). Bruno has an isolated cottage, a bit of land, a dog and a mobile phone he can’t work. Ah, so quirky! He has an ally in the left-wing mayor and everybody in the town loves him because he is on their side. The European Union, French nationalists, drug-dealing Dutch Nazis and several other détails de la vérité throw temporary clouds over the agreeable setting before order is restored without too much excitement or disturbance to the digestion. And then it’s over, until next time. Loved it, but I’m going to save the next installment until the end of Summer. Best not to glut on these things. I thought I’d get that out of the way. If I had my way, the motor car would be on its way out, and economic structures would be reorganising themselves into small-area local units, preferably co-operative, in which all necessities were produced within the communities who need them and commodities were traded via airships, aerofoil-powered sailing ships and horse-drawn wagons. That’s a bit of a pipe-dream though, so it is a good thing that some American capitalists are beloved of the idea of being ‘visionaries’ and inventing ‘disruptive’ technologies that are challenging the worst excesses of reactionary cartels in the transport and fuel industries. In fact, Elon Musk is South African by birth, which you no doubt know, as he is one of the most influential people in the world at the moment. I had missed a lot of what he is about, as I assumed he was another Ayn Rand-worshiping libertarian whose main goal was to abolish taxes and get everyone to leave him alone. It turns out I may have had him confused with Jeff Bezos. A month or so back, I happened upon the video of Musk launching the Tesla Model 3, and was rather intrigued. If we can’t get rid of cars, it makes sense to mitigate their worst qualities: principally, their filth, and the disastrous power imbalances created by the market for their fuel. It wouldn’t hurt if we could also do something about the number of people they kill, as well (about 1,200,000 per year). He spoke in ‘visionary’ terms about what his company was aiming for but, unusually, the product he unveiled seemed to live up to a large part of that vision. In the face of all the neigh-saying and obstruction that has bedeviled the application of renewable energy to transportation, his companies have addressed the key issues: 1, generation and storage; 2, distribution infrastructure; 3, the practicality of the final product for the existing economy. It’s worth noting that in the process they have produced three models of car which, even for me as a car agnostic/hater, are extraordinarily attractive. There aren’t many reasons I wish that I were rich, these days -I am perfectly satisfied with my economic niche- but I would love to own a Tesla Model X. Unfortunately, they are $100,000, and we paid £6,000 for our car. Ah well. However, Musk has been quite transparent about the fact that his whole plan for Tesla was to produce luxury cars that would support the development and production of what passes for an economy car in the U.S. market: the Model 3 costs $30,000, which is comparable with a mainstream petrol-engined vehicle. Several of the ‘yes, buts’ have been creatively addressed, such as the weight of the batteries, which aren’t actually that much heavier than a ‘performance’ petrol engine, but whose weight is offset by the use of aluminium in the body and fitted low in the vehicle to provide stability. Finally, although this isn’t covered in the biography in much detail, as it is a recent development, he has attacked the cost of the batteries, by massively increasing the production capacity of the world market. Genius is an over-used word, but there is something about Musk which resonates with a lot of plot-device mega-founders in classic SF: if this were a 1970s science fiction book, Musk would be the guy who invented the lightspeed engine, or the free energy machine that released humanity from its self-destructive course and launched it to the stars. And, that’s another of his goals. SpaceX is now a revenue-earning commercial cargo company, making regular, reliable and cheap launches to the ISS, and his aim is to reach Mars. I am less sanguine about that. I have a sense that, for some very rich people, although not, as far as I can see, Musk, the idea of an escape to the stars is an excuse for resisting change on Earth. When I hear people saying that we MUST find a way to open up space, I find myself muttering “Whitey’s on the Moon.” It’s not that I’m opposed to space travel, in principle; just that I think there is a lot to sort out at home, first. Priorities, people! Finally, and most excitingly, although it’s his least successful commercial venture so far, Musk is co-owner of the largest solar generation installer in America. He has recently combined that area with Tesla, producing batteries for home use, and Tesla’s website, thrillingly, is advertising a product I have been thinking would be a good idea for years: solar generating roofing tiles. If he wants to have a word about my idea for bobbly PV roofing tiles, he can contact me in the usual way. You’re welcome, Elon. It’s the least I can do for such an admirable man. The biography is by a journalist, Ashlee Vance, and is a fairly standard “written with the co-operation of,” effort. It is clearly an approved version, produced at arm’s length from its subject, allowing for some dissenting opinion and a bit of low-key personal scandal (he’s fired quite a few people in his time and his first ex-wife is not a devoted fan) but manages to meet the main challenge of recording Musk’s achievements so far: fitting them all in a comprehensible text. Musk is only 46, but he has done an awful lot in that time. Making a clear story out of the overlapping projects takes some doing, and Vance does an excellent job of showing how the complementary projects have reinforced one another while, at the same time, stretching even this most capable and energetic of people almost to breaking point on several occasions. The genesis of Paypal, which was the company that resulted from Musk’s early attempt to create an entirely online bank, is not really an exciting story, but Vance keeps it moving, and the sheer fascination of how dogged force of will drove Musk to produce a workable model for the software, before his business partners decided he was going in the wrong direction and merged his efforts with Paypal, kept me reading. The battle to produce a space rocket -a space rocket- on a budget is mind-boggling, and the story of Tesla is truly beautiful, almost (I stress, almost) making me wish I had been good at sums and had become an engineer. I did wonder, on a couple of occasions, whether this was all a wind-up. Could it be that computers have already so reshaped our reality that we are living in a sort of Cartesian ‘malevolent phantom’ world, in which impossible wonders are presented as truth? Could one man really be behind three of the most revolutionary companies to have come into existence in the past decade? It’s almost as though, in our time of need, the messiah has descended, and there is a little of that tone in Vance’s approach, try as he does to maintain journalistic distance. However, there are Teslas on the road, in increasing quantities, and the technology is spreading through the motor industry: you can already buy a second-hand Nissan Leaf. We live in an age of wonders, and of accelerating change, as well as an age of worry and impending disaster. Reading this book has, for a little while, made my sense of hope a little bit stronger. Not all capitalists are utter fools. I’ll have one in large, please. And, while I may never be able to afford a Model X, when my cyclist’s legs can no longer manage the commute unassisted, I may turn my eye to a more modest electric vehicle. Spinny. I am not a steampunk fan, in general. For me, the Victorians were defined by their rapacity, not their glamour, and urban squalor is just squalor: I don’t see the romance. I have read a few of China Mieville’s novels – I read Perdido Street Station on our honeymoon, as it happens, which was more romantic than it sounds- but I have not yet been drawn to abandon Science Fiction for Fantasy on the strength of arcane tech and corsets, much as I love a good airship. For some reason, though, when The Aeronaut’s Windlass turned up on my Kobo suggestions email, I felt strangely drawn. I must have been having a camp moment, given the cover art. Moving on, I read the preview. It was on sale, so I bought it, thinking it would languish in the reserves list of my Tolino. And then I read it. I’m not good at leaving a little supper for tomorrow, either. It’s good. Not, ‘oh my goodness, this has changed my life,’ good, but better than Death in the Dordogne, and not quite as good as HHhH. Jim Butcher, according to Wikipedia, is a big noise in the fantasy world, and his website has an impressively busy forum board. He is very prolific: only 45, he has produced fifteen volumes of his series, The Dresden Files, and six volumes of The Codex Alera. The Aeronaut’s Windlass is the first volume of a series called The Cinder Spires, and he plans to produce a second volume after his current novel is complete. He is, certainly, a cut above the routine. The Aeronaut’s Windlass was a runner up for the 2016 Best Novel Hugo (N.K. Jemesin won it, which makes me happy). The book is cleverly plotted, although its story turns out to be a standard enough romp. What he is really, really good at, is unobtrusive, economical world building and strange, convincing military technology. The Aeronaut, Francis Grimm, is a privateer captain of an airship, Predator. He was cashiered from the navy of Spire Albion, one of the ancient, vertical habitations that rise from a hostile planetary surface that is out of bounds for humans, and from which terrors constantly threaten to arise. The spires sound like termites’ nests: they are layered cities reaching high into the sky and each is a sovereign state. Albion is a monarchy, ruled by a detached, visionary monarch called the Spirearch. After a sneak attack on their spire by a rival spire, the Spirearch recruits Grimm to take an etherealist, a sort of sorcerer, named Ferus, and his apprentice, a young woman named Folly, down-spire to a lower level (Habble) to investigate dark goings on. They are to be supported by a trio of aristocratic city guards, including a young woman who is friend and sidekick to an intelligent cat, named Rowl, who is, for me, the star of the book. Much dark plotting ensues, and a great deal of cut and thrust, made more interesting by the inclusion of both weird and terrifying wildlife crawling through the sewers and the brilliantly under-explained technology/magic of this world. The villains of the piece, a sinister enemy etherealist named Miss Cavendish and her personal servant and hitman, Sark, are sinister and deeply drawn. Butcher’s gift for revealing only as much as is needed to keep the story moving works powerfully to create real menace here. The triumph of the book, however, is the naval action: the logic of the airships. They use various forms of power, but chief amongst them are crystals, that provide both lift and drive. They are very valuable and vulnerable and their function and fitting is woven into a section of the story with great grace, so that when the final battle occurs, we are fully familiar with their tactical use. In addition, there are sails of ethereal webbing and, in some, larger ships, steam engines. The terror of bombardment and violent maneuvering in a ship miles above the ground is brilliantly detailed. I felt the same sense of excitement and threat from the action as I got from reading Patrick O’Brian’s Master and Commander series. The peril seemed real and the terror tangible. Recommended. Meaningless, like most fantasy, but vivid, thrilling and full of life. A fine novel. And that’s it for this time round. I’m going to put a separate link for my reading posts on my homepage, as this promises to become a regular thing. My current read is an intriguing SF/literary effort by Elan Mastai called All Our Wrong Todays, and I’ve also bought a copy of Howl’s Moving Castle, which I’ve wanted to read for ages. Apart from that, Mockingbird has made me want to read The Man Who Fell To Earth, and so that’s on my buying list, along with the second of Yoon Ha Lee’s Machineries of Empire series, The Raven Strategem. I reviewed his first, Ninefox Gambit, last time, and it was bonkers, so I’m looking forward to that. For now, thanks for reading.